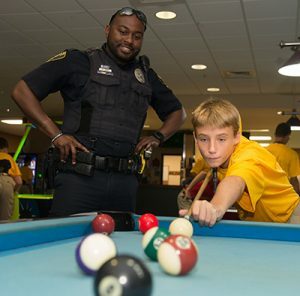 The Southern Illinois University Edwardsville Police Department continues to be a strong, involved supporter of the Team Illinois Youth Police Camp. Coordinated by Illinois State Police (ISP) and hosted in partnership with SIUE Police and other Metro East agencies, the 14th annual residency program was held from July 15- 21. Nearly 60 cadets from across the region participated. 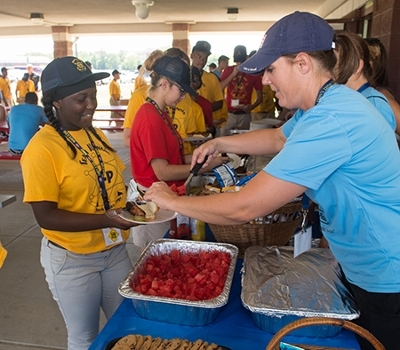 Four SIUE Police female officers volunteered as leaders and mentors for the entirety of camp. On July 20, the cadets visited SIUE’s campus for an interactive day that included bowling at Cougar Lanes and a BBQ prepared and served by SIUE Police. ISP Trooper Calvin Dye Jr. and Sgt. Joey Watson emphasized how SIUE’s support and honorable minority hiring practices have boosted the camp’s growth and success. 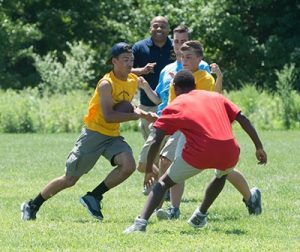 Team Illinois Youth Police Camp teaches a set of life skills that will help kids grow and develop as emerging leaders. Watson says those skills begin with courteous and respectful behavior. Cadet Valerie Huston, of Mount Vernon, says she has benefited from those lessons. Darrell Perryman, a 14-year-old cadet from Swansea, agrees it takes personal effort and teamwork to succeed. SIUE senior Cynthia Holten, of Shiloh is slated to graduate with a bachelor’s in criminal justice studies in December 2018. The camp mentor says her passion for being a positive influencer in law enforcement was ignited when she attended Team Illinois Youth Police Camp at the age of 15. “This camp made a huge influence on my life,” Holten said. She has completed an internship with ISP and aspires to become a state trooper. The weeklong camp concluded July 21 with a graduation ceremony at Calvary Baptist Church in Alton. The ceremony’s guest speaker was Olympic legend and gold medalist Jackie Joyner-Kersee.